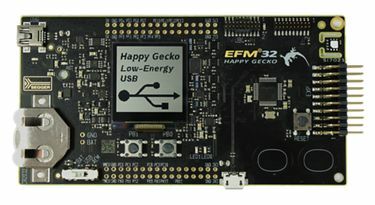 The EFM32 Happy Gecko Starter Kit EFM32HG-SLSTK3400A contains a MCU from the EFM32HG family built on ARM® Cortex®-M0+ processor with excellent low power capabilities. The EFM32HG SoC has six GPIO controllers (PORTA to PORTF), but only three are currently enabled (PORTB, PORTE and PORTF) for the EFM32HG-SLSTK3400A board. In the following table, the column Name contains Pin names. For example, PF4 means Pin number 4 on PORTF, as used in the board’s datasheets and manuals. The EFM32HG SoC is configured to use the 24 MHz external oscillator on the board. The EFM32HG SoC has two USARTs, two UARTs and two Low Energy UARTs (LEUART). USART1 is connected to the board controller and is used for the console. Connect the EFM32HG-SLSTK3400A to your host computer using the USB port and you should see a USB connection that exposes a mass storage device (STK3400) and a USB Serial Port. Copy the generated zephyr.bin in the STK3400 drive.